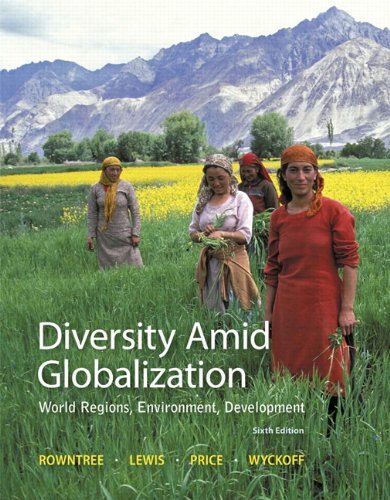 Diversity Amid Globalization takes students on a journey into the connections and diversity between people and places–the contrasting regions of the world–within thematically organized regional chapters. With an arresting visual layout and new and updated content and maps throughout, the text maintains and strengthens its hallmark thematic organization and focus on globalization, while encouraging students to participate in the material using a number of stimulating, interactive learning tools. Available with MasteringGeography™, the most effective and widely used online tutorial, homework, and assessment system for the sciences, Diversity Amid Globalization, Sixth edition offers the most complete and integrated world regional program available today. Students learn how to think outside the map: MasteringGeography and textbook-integrated technology take students outside of the pages of the book, and into the world of distant places and people. An amplified global perspective through NEW and updated content: This new Sixth edition maintains, refines, and strengthens the text’s hallmark thematic organization and focus on globalization in a number of ways. In Population and Settlement sections, there is anew discussion of “Demographic Transition” that includes adding a fifth stage to traditional model. A consistent thematic chapter organization encourages students to compare regions and discourages memorization of facts and places. An active learning approach encourages student participation with the material and ensures effective reinforcement of the concepts through the text’s pedagogy, fundamentals, and tone.